Accidents involving commercial trucks, tractor-trailers, and 18-wheelers often cause debilitating and life-threatening injuries to passengers of other vehicles. Not only is the level of devastation more significant, but the legal complexities associated with proving liability compounds the physical, emotional, and financial turmoil truck accident victims experience. 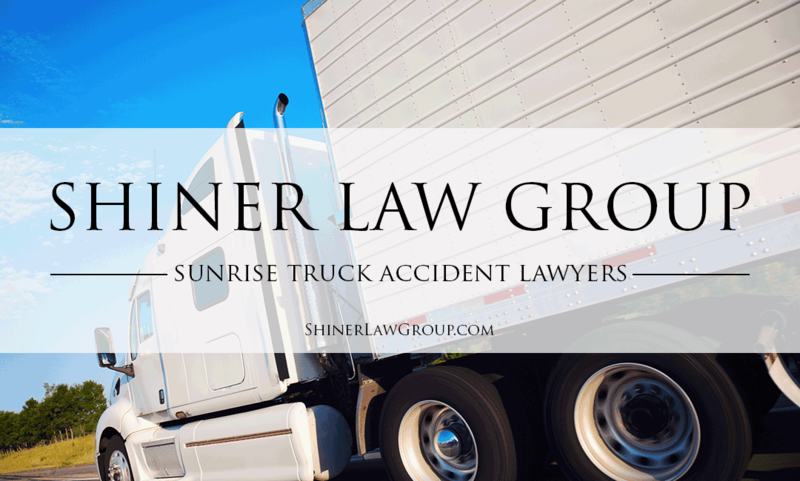 At the Shiner Law Group, our seasoned legal team has an in-depth knowledge of the trucking industry’s standards and practices and can aggressively advocate obtaining the substantial and favorable results you deserve. If you or your loved one has been injured in a Florida truck accident, contact our experienced truck accident attorneys to discuss your case in a free consultation, as you may be entitled to financial recovery. Truck accident victims can pursue a legal cause of action against a negligible party for injuries including, but not limited to, medical treatment and rehabilitation expenses, lost wages, reduced earning capacity, past and future pain and suffering, disfigurement, disability, and a permanent inability to engage in gainful employment. If a family member or loved one is wrongfully killed, an experienced personal injury attorney can also file a wrongful death claim to recover damages and mitigate financial hardship. The statute of limitations for pursuing a personal injury claim is four years in the state of Florida, or two years in cases of wrongful death, which makes obtaining legal representation vital to maximizing your case’s financial recovery potential. Commercial vehicles often carry an average weight that exceeds 10,000 pounds, and despite state and federal regulations, truck drivers who engage in negligible behavior, failing to exercise reasonable care in the operation of their vehicle, exacerbate the risk of causing catastrophic injuries. Hours of service violations that contribute to exhaustion and fatigue. Lack of training, supervision, or hiring practices. Aggressive driving, such as speeding, tailgating, or other traffic safety law violations. With over 15 years’ experience representing truck accident victims and their families in Sunrise, FL, the award-winning truck accident attorneys at the Shiner Law Group have recovered millions of dollars in settlements and verdicts because we are committed to providing our clients with the legal resources to secure the strongest financial compensation package, particularly if the incident of negligence resulted in a wrongful death. As insurance companies will vigorously defend their policyholder(s) to minimize payout, we similarly pursue the best results to hold at-fault parties accountable. Successfully litigating a truck accident claim rests with a substantial evaluation of the crash site. Our seasoned trial lawyers conduct a thorough and independent investigation of the facts, recover critical evidence (log books, computer data, receipts, and bills), consult a network of leading industry accident reconstructionists, facilitate insurance negotiations, and maintain effective client communication to help you build the most compelling claim. We focus on the legal complexities, so you can focus on what’s most important – your recovery.